With just a little prep work, this snack is simple to make. 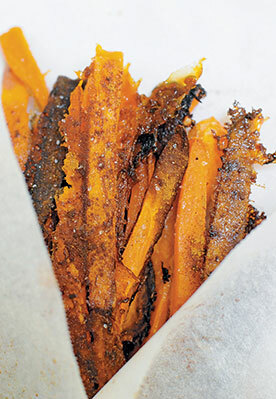 The key is to keep a bag of pre-cut sweet potatoes in the fridge and then just bake and serve. 1. Preheat the oven to 425°F (220°C, or gas mark 7). 2. Use a mandolin slicer to cut the potato into medallions about 1⁄8 inch (3mm) thick. You can also use a knife to cut them into a traditional french fry shape (or medallions). 3. Place the potatoes in a 1L resealable plastic bag, add the arrowroot powder, close the bag, and shake so the arrowroot fully coats the potatoes. 4. Lay the potatoes out flat on a baking sheet (without parchment paper). Drizzle with coconut oil and bake for 20 minutes. Turn and cook for another 5 to 10 minutes, until crispy. Sprinkle with salt and cinnamon. 5. Allow to cool long enough so you won’t burn your mouth, then devour!